We are all aware that getting enough sleep at night is crucial for functioning effectively in the day time. Yet this is an important issue for many of us because we are simply not getting enough sleep with our busy lives. If you are one of the people for whom sleeping is difficult, or you find it hard to just switch off at the end of the day, then read on for 5 top tips to not only improve the quality of your sleep patterns, but to also help you feel more relaxed in the process. It is certainly far easier said than done, but we are unconsciously programming our brains for better sleep when we have a set routine or sleep pattern in place. This organisation or 'patterning' of our behavior to influence and improve brain functionality can even be applied to our other daily activities such as eating, drinking and exercising. To achieve better quality sleep, we therefore need to consider how we can help our mind to unwind. One way to achieve this and to better organize your thoughts from the day, is through writing a to-do list. Then, quite simply, if you have not completed your list of tasks or jobs by the end of the day, then it is okay to leave that list unfinished for tomorrow. You will hopefully have a more restful and less worrisome night's sleep because everything you need to do is safely written down for tomorrow and so these tasks can be ‘freed from your mind’ so that in theory at least you shouldn’t be tossing and turning with them in your mind. In terms of scheduling sleep, our brains thrive on rituals and patterns. Think about how many tasks you perform each day the same way, from brushing your teeth and getting dressed, to combing your hair or driving your car. You would probably agree that these are tasks you are confident in doing? Tasks which you don’t have to think too much about to achieve to the best of your abilities? Well, try to approach sleep in the same unconsciously controlled manner and see sleep more as just one of these simple ‘task to accomplish’. Picking a set time to go to bed each night can also be helpful, but don’t put too much pressure on yourself to follow this too precisely. Instead, use it as a ‘body-clocking guide’ in a similar way to how we all say “oh look it’s 12 o’clock or 1 pm, it must be lunch time”. So in a similar manner say; “oh look it’s 10.30 pm, I should be thinking about going to bed now”. Mentally, we know we are all capable of switching off, so have more confidence in your body and mind so that it can just take over and send your head peacefully away on your pillow. 2. Don’t Distract Your Sleep - Turn Off Those Devices! Stop pressing buttons, looking at screens of any kind or talking on the phone! ‘Sleep time’ really needs to be ‘me time’ in order for you to benefit effectively from it. You may think watching T.V or playing games is a way to wind down and that would certainly be correct. However, when it comes to sleeping, these gadgets with lights actually inhibit your brain’s production of the sleep hormone melatonin, (which helps your brain differentiate between light and darkness), so you’re not actually doing yourself any favours because you are in fact making your brain and body more alert; the opposite of what you are trying to achieve! So simply switch them all off and in turn, associate your bedroom with simply resting and relaxing, rather than a place to watch T.V at night. Even reading can keep you alert and can make you associate your bed with reading which you don’t want. Complete darkness is best so ensure your curtains are thick and that you can have peace and quiet in your environment. If this is difficult then ear plugs may aid you. Food and drink certainly play a large role in brain functionality and in our performance levels throughout the day, but that would be a topic for a different article. In terms of bedtime, try to stop eating approximately two hours before you go to bed because your stomach would still be trying to digest that food when you sleep. Your body therefore can’t burn recently consumed food off during sleep if it is spending all its energy digesting it, so you are more likely to put on weight this way. Try not to drink any liquids at least an hour before you go to bed too, in order to stop you waking in the night and needing to visit the bathroom. Following these simple but often overlooked and forgotten points, we can dramatically improve our quality of sleep over time. Exercise on the other hand, will help your body feel good because hormones such as serotonin are released. You can potentially fall asleep faster when you have exercised in the day time, and if you suffer with insomnia or depression, then every little trick could help you achieve better sleep and to feel better in yourself. We have discussed how you need to relax your mind in order to achieve better quality sleep, but your body also needs to be able to unwind. If you aren’t someone who practices yoga, maybe look into joining a class that is local to you because yoga has many advantages to aiding restful sleep and in helping your muscles unwind. Have you tried deep breathing and visualization exercises?You can find these online. Herbal remedies exist but try instead of taking tablets, to use a lavender pillow spray. The smell is peaceful and soothing. Lavender has long been associated with having many calming properties so it could be worth giving this a try. In addition, having a warm bath or shower before bed will help sooth your aching muscles and slow your heart rate. It will widen your arteries which will lower your blood pressure, giving you a sense of calmness. Especially if you are normally more of a 'shower than bathing' person, then treat yourself and enjoy a relaxing hot bubbly bath with some candles beside you before bed, and I guarantee you will be able to feel the difference. Finally, if you have tried every technique in the book and lack of sleep is still severely interfering with your daily functioning, then always discuss it with your family and friends and seek medical help. Remember there is always a way to improve the quality of your sleep, you just have to try out different methods and find what works best for you. Here is You Tuber Dr. Josh Axe in the You Tube video below discussing the dangers of not getting enough sleep and offering some natural solutions to combat lack of sleep. 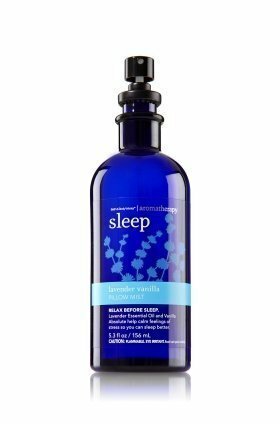 Bath & Body Works Aromatherapy Lavender Vanilla Sleep Pillow Mist 5.3 Oz.